If you're a keen angler an angling holiday could be right up your street. It gives you the opportunity to spend quality time angling alongside fellow enthusiasts. 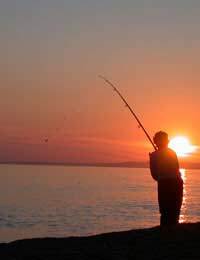 Angling holidays are available all over the United Kingdom - as long as there are lakes to fish in. You can choose to go through a holiday company that specialises in putting on angling holidays, or alternatively, you can go it alone. Should I Go Through a Holiday Company? The main benefit of going through a company is not having to find and book your own accommodation. They may also offer activities to amuse the rest of the family while you spend time angling. These include games rooms, swimming pools and sauna / Jacuzzi facilities. Some holiday facilities are located near areas that are good for walking. There are also holiday packages that offer angling holidays abroad. This gives you the opportunity to catch fish that you wouldn't normally be able to find (in UK waters). It also allows the rest of the family to enjoy a holiday abroad, where there's sure to be plenty to keep them occupied! The other alternative is organising your own holiday. This generally means making your own travel and accommodation arrangements, but it does mean that you aren't restricted to staying a set number of days. You are also free to fish wherever you choose, rather than relying on pre-arranged fishing activities and trips. Booking a trip abroad is obviously still an option, but it can be a lot more hassle than planning an angling break in the UK. Finding flights is simple enough, but arranging accommodation abroad (without the help of a holiday company) can be stressful. There are websites that can help with this, but you will probably have to look into the local public transport systems, as the accommodation options available may not be anywhere near the best places to fish. If this is the case, it might be worth hiring a car when you get there. How Much Does an Angling Holiday Cost? The price varies a lot. An average price is £500 for a week's angling, but this usually refers to a basic package, and may not include additional extras like facilities. Much depends on whether you're planning a holiday in the UK or abroad. As with most holidays, booking a late deal is usually the cheapest option, but bear in mind that the weather may be less than desirable at off-peak times of the year. Look out for special offers too, as these can lower the price even further. These are often offered during off-peak periods too. Planning your own angling holiday might work out to be more expensive than booking through a holiday company, as flights, accommodation and so on have to be paid for separately, and this can soon add up. An angling holiday can be a great way to interact with other anglers, and you're bound to get plenty of time angling. You might even make some new friends!